March 1938 and former Hungarian cavalry officer, Nicholas Morath, travels Europe from his Paris base performing duties for his uncle, the diplomat, Count Polanyi. Polanyi trades information, favours and conspiracy with the intelligence agencies and rogue agents of various countries as he tries to steer Hungary away from the clutches of the fascist Arrow Cross party and Nazi influence. Morath drifts through the shadows, carrying information, aiding people cross borders, funding political activity, encouraging and cajoling reluctant patriots, and trading intelligence, traipsing between Paris, Antwerp, Vienna, Budapest, Romania, Ruthenia, Slovakia and Sudeten mountains for clandestine meetings. It is clear the war is coming and the pressure is starting to build as Morath tries to ease political tensions, persuade his mother and sister to leave Hungary, maintain his relationship with Argentinian mistress, Cara, and keep his advertising business ticking over. Furst’s novels are multi-layered, atmospheric affairs, full of crafted prose and understated plotlines. Kingdom of Shadows is no different. An awful lot happens in what is a normal length novel, as Morath criss-crosses Europe sliding in and out of various scrapes, and yet the pace seems leisurely and evocative. Furst is very good at setting a scene, placing the reader into a landscape, and in providing in an economical fashion the contextual politics both locally and at a European scale. In this sense, the reader comes to understand the fully geopolitical complexity of what was going on, without it swamping the narrative. That takes some skill and yet Furst makes it look effortless. As with his other novels, various strands are left somewhat ambiguous, a snapshot of one set of social relations at a particular place and time. My only critique is sometimes the storytelling is a little too understated, especially when something truly dramatic is taking place (being shot at and chased has the same tone and feel as meeting a girlfriend), and there is a little too much ambiguity at times. But when all said and done, Furst has a distinctive voice and its always a pleasure to read one of his books. 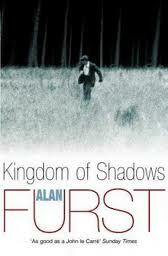 I've enjoyed all of Alan Furst's spy novels. Furst is a master of this type of book. I'm a big fan of Alan Furst's books. This one is on my shelf to read.